Spicy Cashews for sale. Buy online at Zingerman's Mail Order. Gourmet Gifts. Food Gifts. Cyrilla Suwarsa and her family make one of my favorite food finds of the last few years. It’s a big Indonesian family affair—Cyrilla’s sister made the recipe, her brother-in-law built the roasting machine and her mom hovers above it all, checking that the flavor is right. They take several steps that others rarely do when processing nuts. For one, all the cashews are hand harvested and slowly sun dried. As with other sun dried foods like rice, couscous and tomatoes, the flavor is much more developed this way compared to furnace drying (it also uses no fossil fuels). She also sources nuts in shells, taking the extra step to peel them only as needed, which goes a long way to preventing rancidity—a common affliction of many packaged nuts. Finally, Cyrilla’s cashews are slow-roasted. The roasting makes the cashew have a firm pop to its texture. 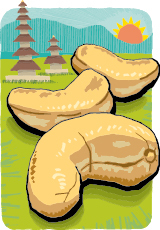 These don’t have the chewy fleshiness you might be used to with typical cashews and you’re not going to miss it. Roasting also brings out more flavor—these have loads of it. Then, there’s the spicing: chile and lime leaves. It’s not terribly hot, but there’s a little sizzle and the lime leaves give a bright gleam of green flavor. I’ll leave it to you to describe them further after you eat a pack, which you’ll do in a minute since they’re so good. Better buy two.